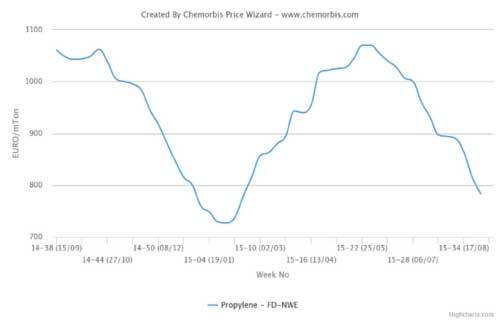 Propylene prices in Europe have fallen rapidly amid derivative issues, with spot prices flat to the monthly contract price for October, compared with premiums of 10-13% two weeks ago, as per sources in Platts. 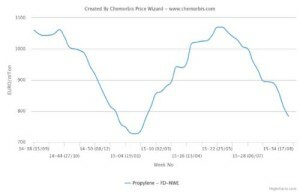 Platts October propylene contract price indicator was assessed Tuesday at Eur722.50/mt, pointing to an increase despite recently weak propylene demand. The derivative outages include polypropylene units of Borealis and Ineos among others, sources said. Borealis declared force majeure on PP production from its site at Kallo neighbouring Antwerp, Belgium on September 15, a company spokeswoman. Ineos’s 235,000 mt/year polypropylene plant in Grangemouth, Scotland, started a four-week planned maintenance earlier this month. Also earlier in September, autumn steam cracker maintenance in Asia and Europe tightened propylene supply in Europe and hit derivative margins. “Some derivative did not want to pay a 10% premium to the contract price,” a propylene buyer said, adding imports have also increase propylene supplies.